Chiavari chairs are a beautiful choice for almost any event. However, many people are afraid to decorate them because they think it might end up being "too much." Our team is here to put that myth to rest by giving you all some great ideas on how to decorate Chiavari Learning How to decorate a Chiavari chair would help you put the perfect finishing touches on your next event. Ribbons-Great with Chiavari chairs because you can choose ribbons of all different sizes, shapes, and colors! If you are working on an event with a particular color theme, ribbons can be very helpful because are and inexpensive but still look very classy if done right. The most diverse choice for decorating Chiavari chairs is the use of flowers. Using flowers gives you hundreds of different options for your chairs and really allows you to personalize the event you are planning. Try picking out your client's favorite flower, or maybe one that works with the season, to really set the tone. You can also try using different types of leaves or sticks to really change up a look! Chair covers are a great way to decorate the chairs while also keeping them in tip top condition. The only concern would be still getting to the beauty of the Chiavari chair. If your client is concerned about that, we recommend trying a sheer cover! One less commonly used, but very nice, accessory is beads. These are great when you are planning an event that is supposed to be very bold and in-your-face. Using beads for things like "Gatsby"-esque weddings can really tie a theme together! 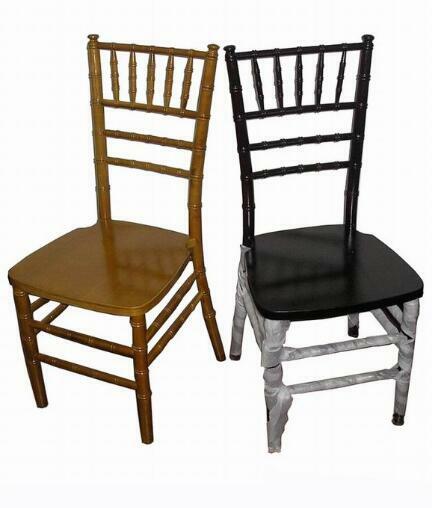 No matter what you choose to decorate the Chiavari chairs at your next event, we know they'll end up looking great! From ribbons to flowers to covers to beads, we know you find the perfect extra details to make your event the best one yet.